This is a beautiful necklace that is handmade by me. 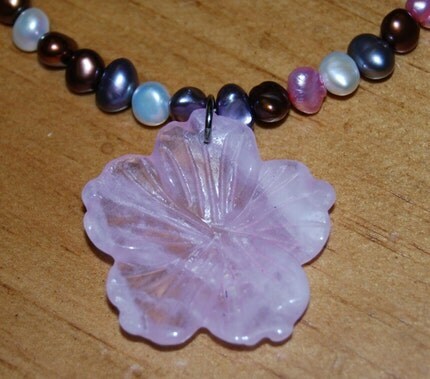 It is made with real freshwater pearls in brown, pink, peach, purple, and cream. The focal point of this necklace is a carved rose quartz hibiscus pendant. This necklace will make you feel like you are visiting a tropical island anytime you wear it. Necklace measures 16" and it has a tropical lead toggle clasp to finish off the tropical look. This is a beautiful piece, always one of a kind, and made with excellent quality! Folksy :: Buy "Cultured Freshwater Pearl and Carnelian Necklace and Bracelet Set"